The third year of the program was centered around creativity. Throughout the summer we read the book, Sparks of Genius: The 13 Thinking Tools Of The World’s Most Creative People and analyzed its use in education. The tools discussed in the book were incorporated into our assignments, as we designed multimodel artifacts that reflected our discussions of creativity. Another aspect of the summer was the design process’s role in education. Through the study and practice of the design process, we collaborated to create solutions for multiple problems in the field of education. The focus of the final year was to develop not only educational technology users, but leaders that will facilitate change outside of the MAET program. I often feel as if some of my students have altered views of the world, sometime completely different from their classmates. I also feel that some students have a hard time viewing the world outside of their city. I used Photoshop and my iPhone Camera to capture this phenomena in my iGraphic project. The task was to create a video that “inspired the viewer to consider an important educational idea”. I choose to focus on the obstacles that many students face outside of the classroom. Although most students are not affected by every situation in the video, I feel every teacher has a student who struggles with on of these obstacles. Due to the amount of responsibilities, number of students and expectations placed on teachers, a students external obstacles can be often overlooked by their teachers. I made this video with the intent of reminding fellow teachers to think outside the classroom when trying to identify what is causing a student to struggle. For this assignment, we were given an afternoon to create a video that articulated an assigned topic from the book, Sparks of Genius: The 13 Thinking Tools Of The World’s Most Creative People. The idea I was tasked with illustrating was schematic patterns. The constraints of this assignment were that it must be made from using only video & audio found through Creative Commons, and that it be no longer than 30 seconds. I joined the MAET program in the summer of 2011 as a year 2 student. During the second year of the program, the focus is on the ability to conduct educational research as well as hosting an educational technology conference. I focused my research on improving my students ability to relate to course content. For the educational technology conference, I co-led a session on the gamification of education. Throughout the year I became familiar with a host of technologies that utilize both collaborative and independent learning skills. I have facilitated the use of these technologies not only during my course work, but also in my classroom and with colleagues. Create an image that shows several of your characteristics. The image was captured using an iPod Touch 3rd generation. The image was edited using Picasa. 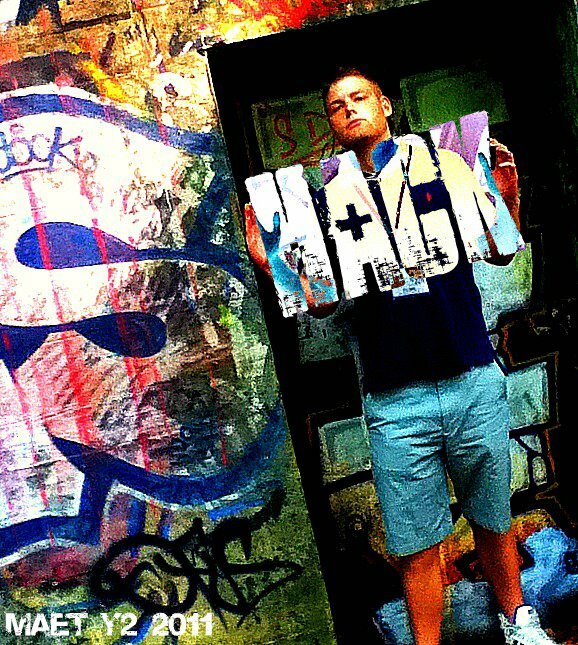 The three characteristics portrayed in my image are, history (WWII bunker in background), love of hip hop (graffiti) and fascination with technology (altering image to show “Shack” being held). During the summer of 2011, I began my graduate work in Rouen, France with the MSU Master of Arts in Educational Technology program. Throughout the summer we created several projects, including a Dream It Proposal. As a cohort, we also presented the ReLATE Conference. I co-presented a seminar on Motivating Disconnected Students. You can find the recorded presentation here. The slide show used during this session is available for download here. This is a video I created to share with my colleagues, illustrating the use of Google Earth in Social Studies. I include the how and why to use Google Earth in the classroom, and what I expect students to use and how I model this for my classes.